50 DAYS TILL COLLEGE FOOTBALL! And what’s college football without a little team rivalry? 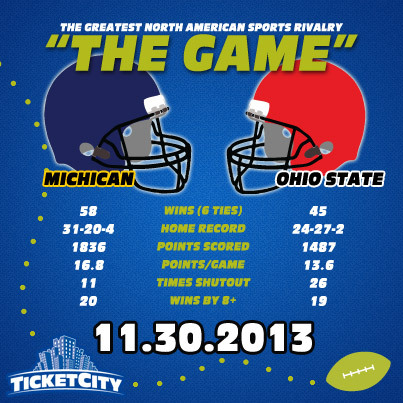 We’ve taken a look at the team records for some of the biggest rivalry games. Which game do you think will be the most epic in 2013? Bigger than both team’s in-state rivals, the Texas-Oklahoma rivalry can’t be matched. The Cotton Bowl turns into a sea of burnt orange and crimson for the Red River Shootout at the Texas State Fair. Playing for the Jeweled Shillelagh every year, many consider the USC — Notre Dame game to be the most important in college football as both teams have the two highest numbers for sending players to the NFL. Said to be the most hard-fought rivalry in all of sports, when the Iron Bowl starts the whole state will be chanting Roll Tide or War Eagle, two of the most sacred terms in the state of Alabama. Separated by a state line and now a division, “The Game“, as it’s often referred, is played solely for one reason- pride- and could conceivably determine the Big Ten champion every year.